Andrew Wiggins has met the hype, but the rest of the 2014 rookie class has fallen short. A recurring theme entering last season’s trade deadline was the reluctance of teams to give up picks in the 2014 draft. The idea was that the abundance of talent in the incoming rookie class was so overwhelming that first-round picks were essentially golden tickets. Passing up the opportunity to make an instant roster upgrade at the expense of a 2014 first-rounder, in other words, made less sense than any other time in recent memory. Teams lurking in the NBA's cellar seemed to be guided by a similar line of thinking. The goal for certain outfits was to construct rosters with the express purpose of losing as many games as possible in order to improve their draft positioning. Observers coined nicknames for tanking teams, most notably “Riggin for Wiggins.” For fans of squads who had fallen out of the playoff race, there was an urge to dismiss the present as a bridge to draft night. The hype surrounding this class of rookies, for better or worse, was monumental. The natural expectation was that many of them would shine in their first seasons, or at the very least show flashes that hinted at the potential for stardom. 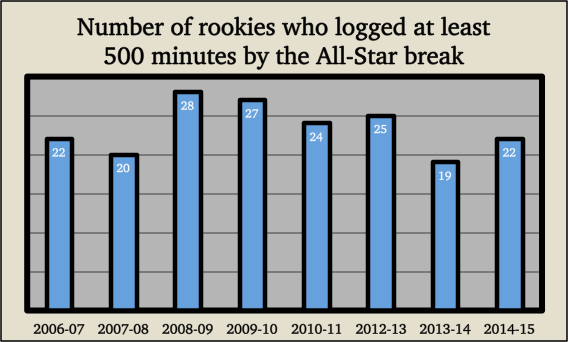 Instead, due to a mix of injuries, unmet expectations and other factors, the 2014-15 rookie class has underwhelmed. The strongest indication may be the general lack of attention surrounding all but a few of this season’s first-year players, although two Wolves first-round picks, Zach LaVine and Andrew Wiggins, garnered national attention by winning individual honors over All-Star weekend. The statistical evidence is damning. Consider that No. 2 pick Jabari Parker has recorded more Win Shares – a cumulative statistic that aims to attribute wins, or percentages of wins, to players – than all but one other member of this class (the Bulls’ Nikola Mirotic) even though he has not suited up since Dec. 15. Or that the rookie who has recorded the highest Player Efficiency Rating – a per-minute statistic that measures player value – while registering at least 500 minutes would have ranked No. 6 and No. 5, respectively, over the entire 2012-13 and 2011-12 seasons. What makes this class’s “meh” first-half performance even more disconcerting is that it came on the heels of a season featuring a rookie class that was largely viewed, in the lead up to the draft, as being bereft of top-end talent. The 2014-15 group of rookies, it was posited, marked a huge contrast from the previous year. In any case, these rookies still have more than 20 regular-season games remaining to salvage their largely unremarkable first campaigns, and there’s a chance many of them will earn more playing time than they did before the All-Star break. Here’s a look at where the 2014-15 rookie class stands in comparison to every class dating to 2006, the first of the so-called “One-and-Done” era. 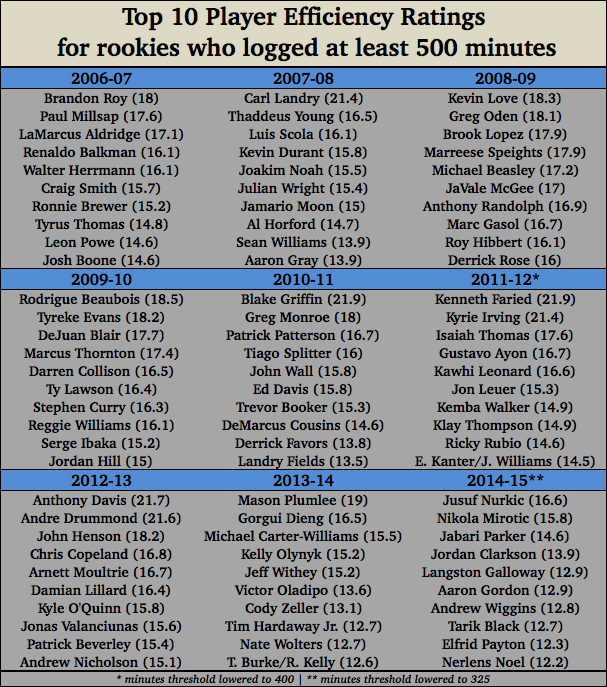 In assessing the relative success of rookie classes, arguably the most important criterion is playing time. While the perception of a certain class is in large part driven by how many stars it contains, a fairer gauge of top-to-bottom quality would touch on total minutes played, or the number of players to reach a certain threshold in minutes. Injuries and positional logjams can hinder opportunities for certain guys, just as an absence of one or both of those things can facilitate more on-court time for others. Any measure of playing time needs to account for the fact that not every team plays the same number of games prior to the All-Star break. However, that condition holds true for every season included in this exercise. In 2014-15, the Magic lead all teams with 56 games played at the mid-February intermission, while the Warriors and Celtics have played a league-low 51 games. Several prominent members of this rookie class have either received a small amount of playing time or not played at all. ​The Sixers selected Joel Embiid with the No. 3 pick knowing the former Kansas standout would miss several months after undergoing surgery to repair a stress fracture in his foot. Taking a gamble on an injured big man made sense for Philadelphia, who under general manager Sam Hinkie has prioritized asset compilation over playoff contention and was set to debut 2013 first-round center Nerlens Noel a year late. For the purpose of this analysis, though, it produced a statistical black hole in a prime draft slot. Another of Philadelphia’s pieces has dragged this class down even further. The Sixers drafted former Louisiana-Lafayette point guard Elfrid Payton with the No. 10 pick but traded him to the Magic for Dario Saric, a future first-rounder and a second-rounder. Saric, 20, is a skilled, 6’10’’ forward from Croatia who recently won his second consecutive FIBA European Young Player of the Year award and may help the Sixers at some point down the line. This season, though, his absence only adds to the negative perception surrounding this rookie class. The fruits of Philadelphia’s larger team-building strategy are difficult to ignore in this context, but there are other players who, for various reasons, aren’t seeing the court as much as expected. Parker, a higher pick than Embiid or Saric, played only 25 games this season while emerging as perhaps the leading candidate for the Rookie of the Year Award before going down with an ACL tear. In that limited stretch, the Duke product logged nearly 30 minutes per game, more than all but one other 2014 draft pick (Wiggins). Meanwhile, No. 7 pick Julius Randle played only 14 minutes with the Lakers before suffering a fractured tibia in his right leg. Other rookies kept off the floor for extended stretches due to injuries include No. 5 pick Aaron Gordon (foot), No. 6 pick Marcus Smart (ankle) and No. 11 pick Doug McDermott (knee). Yet the most obvious reason why some first-year guys are spending most of their time riding the pine or in the NBA D-League is that they aren’t ready to contribute on a consistent basis. On draft night, ESPN analyst Fran Fraschilla famously said that No. 20 pick Bruno Caboclo was “two years away from being two years away.” Accordingly, Caboclo has registered only four minutes over one game with the Raptors. Consider some of the other first-rounders who have struggled to get on the court for the teams that drafted them: No. 9 pick Noah Vonleh (91 total minutes), No. 14 pick T.J. Warren (147), No. 15 pick Adreian Payne (19, and recently traded to the Wolves) and No. 18 pick Tyler Ennis (58). Still, this class is not an extreme outlier in comparison to recent classes when it comes to the number of players who have crossed a certain minutes threshold by the All-Star break. The chart below shows that while the 2014-15 class falls well short of the 2008-09 class, the 2014-15 class matches the 2006-07 class and eclipses last season’s class. Note that the lockout-shortened 2011-12 season, which allotted 35 or fewer games per team before the All-Star break, was excluded. The natural next step is to wonder how this season’s rookies are making use of the minutes they did earn. SI.com stacked up the PER and Win Shares of the 2014-15 rookie class at the All-Star break versus previous classes. This type of analysis is more practical for PER, a per-minute statistic, than Win Shares, which is cumulative. In the absence of a foolproof Win Shares projection system, one can view this rookie class’s total in that category with an eye toward what it could be come April. The best place to start is at the top of the draft, where Wiggins is beginning to make good on the massive hype that surrounded him before he ever set foot on Kansas’s campus. Over the last month alone, the No. 1 pick has set and broken his career high for points in a single game, and averaged 19.8 points over 17 games in January to help raise his season average to 15.2. The Wolves rank second-to-last in the league with a -9.9 net rating, but that figure drops to a -12.4 – more than two points lower than the league-worst Sixers – in the 725 minutes Wiggins has spent off the court. Meanwhile, No. 6 pick Marcus Smart has averaged a season-high 34.5 minutes per game in February and, offensive warts aside – he’s shooting 36.8 percent from the field – is fast developing into one of the league’s top perimeter defenders. No. 10 pick Payton has connected on only four of his 21 three-point attempts but is assisting on a team-high 30.9 percent of the Magic’s field goals during his floor time. And 2013 pick Noel has performed well in Embiid’s absence, though he remains limited offensively and is shooting a low percentage (44.5) for a player at his position. The early returns from other high picks have been less promising. No. 5 pick Dante Exum has moved into the starting lineup and will likely continue to see the floor at Trey Burke’s expense, yet is still getting his bearings in a Western Conference loaded with top-flight guards. No. 9 pick Vonleh has yet to make a substantial impact after enduring a rough start to his NBA career when he missed the preseason because of a sports hernia. And No. 14 and 18 picks Ennis and Warren have spent time in the D-League and rarely gotten off the bench for a Suns team fighting to secure a playoff spot. The chart below shows the total Win Shares accumulated by the last nine rookie classes, including the one corresponding to the lockout-shortened 2011-12 season. Mirotic leads all 2014-15 rookies with three Win Shares, but this class’s total is on pace to rank below every other group on the chart. Keep in mind that Win Shares are influenced by team performance and that some rookies could earn more playing time down the stretch if they continue to improve. While the number of first-round picks who have struggled out of the gate paints a grim picture, other less-heralded rookies have made meaningful contributions. 76ers second-round pick K.J. McDaniels has become a SportsCenter regular thanks to his powerful dunks and blocks. Lakers guard Jordan Clarkson has helped plug the team's backcourt void, and D-League callups Tyler Johnson (Heat) and Langston Galloway (Knicks) showed enough promise during 10-day contracts for their teams to extend them through the rest of the season. Several of this class’s top performers entered with relatively low profiles because they didn’t play for a Division I program before entering the draft. The Bulls dealt a pair of picks and cash to the Wolves for Mirotic’s draft rights in the 2011 draft, but he didn’t debut in Chicago until this year. 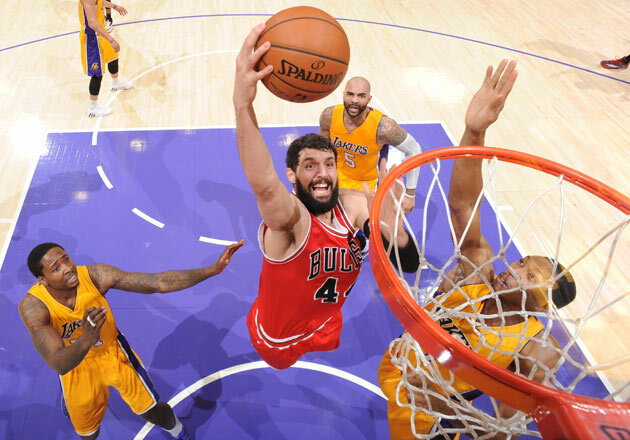 Though his playing time has decreased during February and could shrink even more with Mike Dunleavy returning from an ankle injury, Mirotic has helped breathe life into a Bulls offense that ranks No. 8 in the league in points scored per possession after finishing No. 27 a year ago. Among international rookies selected in this year’s draft, Nuggets center Jusuf Nurkic has been the most impressive. Nurkic, whom Denver acquired in a draft-night trade with the Bulls for McDermott, is averaging nearly 20 points per 48 minutes and has improved the Nuggets’ defense with his shot-blocking and rebounding. The 6’11’’, 280-pounder has gotten more chances to prove himself since Denver traded Timofey Mozgov to the Cavaliers and is so confident that he’s not afraid to sneer at some of the league’s top big men. The chart below shows that Nurkic and Mirotic lead this rookie class in Player Efficiency Rating, though both rank at least 1.4 points below the PER leader of every other season dating to 2006-07. Note that the lockout-shortened 2011-12 season is included with a minutes qualification. It will be interesting to revisit these numbers at the end of the season and compare them to those from recent classes. In any case, we can safely conclude that up to this point the 2014-15 class’s production has failed to meet its hype. All statistics from basketball-reference.com and NBA.com.